JUGS Batting Cage Nets are now available in Polyethylene or Polyester, come in ten stock sizes and come with a Hitter’s Door for easy in-and-out access. Over 138 years of combined net installation experience available from JUGS factory representatives. Call 1-800-547-6843 and let us help you pick the best net for your situation. JUGS Nets are hung on the square and are designed specifically for baseball and softball use.. Heavy-Duty Polypropylene Black Rope Borders on top, bottom, and vertical corners..
Rib-Line Down the Center for extra suspension points with less sagging. WHICH ONE? 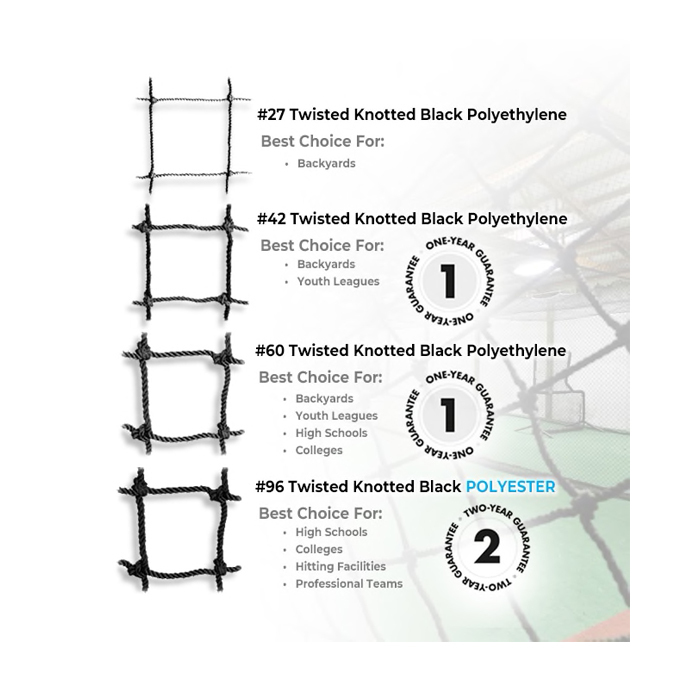 TWISTED KNOTTED BLACK POLYESTER OR POLYETHYLENE? Knotted nets have a higher overall strength and durability rating making them superior for direct impact sports like baseball and softball. Our Nets are hung on the square and are designed specifically for baseball and softball use. Our Best: The highest breaking strength and most abrasion resistant netting we sell—our top of the line netting. POLYESTER netting is mildew resistant to prevent rotting. 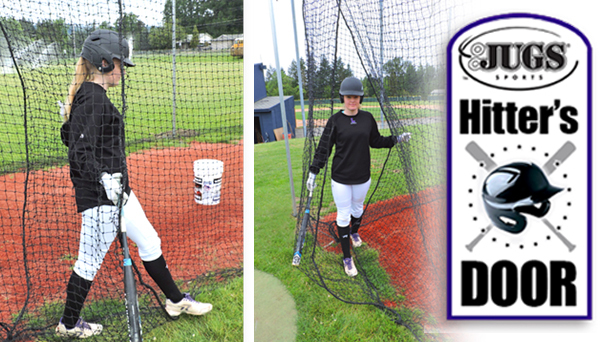 Hitter's Door: All JUGS nets come with a JUGS Hitter’s Door for easy in-and-out access. 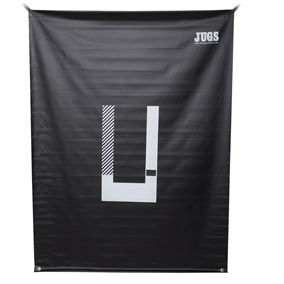 A $150 value—this Backdrop and Pitcher's Trainer come FREE with the purchase of any JUGS Batting Cage Netting. This heavy-duty backdrop will Prolong your batting cage net's life by protecting the rear section of your net. Easy to install and is waterproof. Compatible with indoor and outdoor use. The #1 selling batting cage company in the world. We pride ourselves in giving you the finest-quality netting at the best factory-direct price and guarantee possible.